What is the Rural Development Programme / LEADER? The Rural Development Programme (widely known as LEADER) focuses on improving all aspects of social and economic life in rural areas. 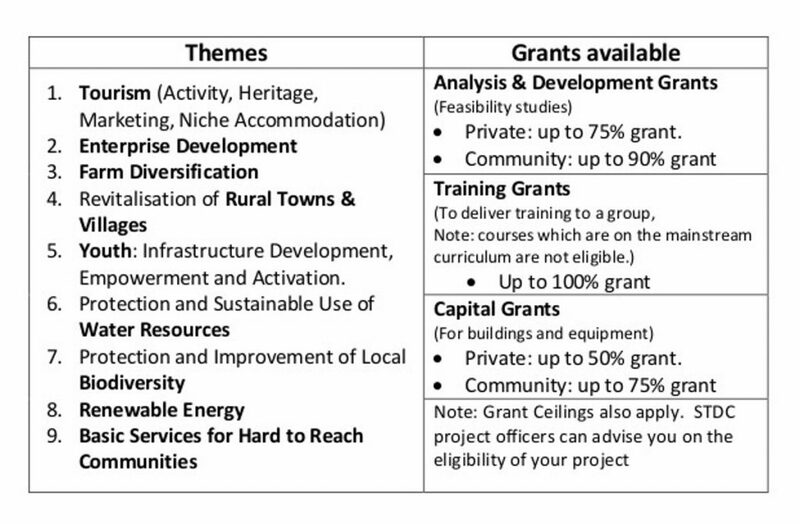 The current Programme 2014 –2020 aims seeks to bring about positive change helping to develop and sustain rural areas for the better through supporting enterprise development and job creation, rural environment, promotion of social inclusion and economic development. The total allocation for County Tipperary for the period of the programme is € 7,562,584. The programme is implemented by South Tipperary Development Company (STDC) in the Municipal Districts of Cashel/Tipperary, Clonmel and Carrick on Suir. Who can benefit from LEADER funding? What kinds of projects can be funded? The criteria for funding are initially laid down by the EU and Government. The Tipperary Local Community Development Committee consulted widely and drew up a Local Development Strategy setting out its main priorities for the county for 2014 to 2020 within that Framework. The full strategy can be viewed below and the updated action plan (May 2018) can also be downloaded.. The programme will be delivered through a mixture of Rolling Calls (continuous), and Targeted Calls which will be time bound and will focus on project category(s)”. Interested parties should contact one of our development officers on (052) 7442652 to discuss their project idea. What projects have been funded in Tipperary? Communities, individuals and businesses who have benefited from funding under the LEADER programme recently include playground developments in Cappawhite and Clonmel, community centre enhancements in Glengoole and Tipperary Town, development of tourism amenities in the Glen of Aherlow, business expansion in Carrick-on-Suir and Cahir and arts, music and creative opportunities for young people across the county. Note* Tipperary Local Community Development Committee (LCDC), a sub-committee of Tipperary County Council, will manage and oversee the RDP on behalf of the Department of Arts, Heritage and Gaeltacht. 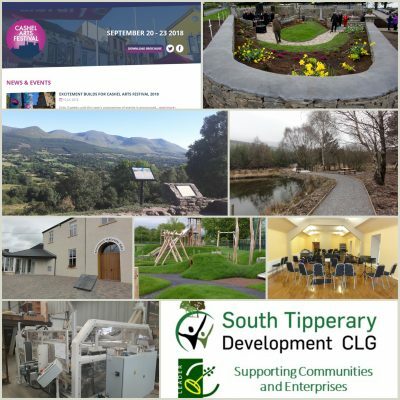 The programme will be delivered by the implementation partners, North Tipperary LEADER Partnership (NTLP) and South Tipperary Development Company (STDC), who will deal with all aspects of the programme on the ground, from answering general queries on the programme to facilitating and processing project applications. With respect to Tipperary, the NTLP will service the Municipal Districts of Nenagh and Thurles/Templemore in the context of its role as implementation partner. STDC will service the Borough District of Clonmel and the Municipal Districts of Tipperary/Cashel and Carrick on Suir in the context of its role as implementation partner.